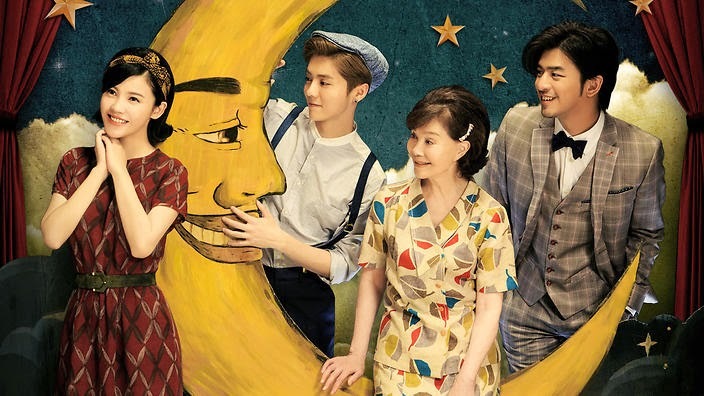 Miss Granny is one of the few K-movies that I've enjoyed over the past few years, so of course I was interested in checking out how the Chinese remake, 20 Once Again, would compare. To put it straight, this film's a no-qualms copy-cat of the original, with line-by-line similarities. In some ways this was frustrating as I would have liked to see some original twists rather than feeling like I was watching the exact same movie over again with different faces, but I suppose in some way this fulfills its goals as a true remake. Overall I would rank the two films on about the same level, but giving the Korean version a slight upperhand for how it dealt with the final story resolution. Spoilers included for those who haven't seen Miss Granny. The main factor shining in this version's favor is the spot-on casting across the board. I much preferred the leading lady here, Yang Zi Shan, over Korea's overacting queen Shim Eun Kyung in the role of the young-bodied Mal Soon. She has a natural grounding and manages to be sweet and endearing without coming across as shrilly or unrealistically OTT, unlike Shim. She's also incredibly gorgeous and naturally eye-catching on screen, which made it more plausible for me to believe her character's sudden turn into a rock star. Bolin Chen and Lee Jin Wook are mentally interchangeable for me (a fair verdict given their sharing of roles both here and with In Time With You) and Bolin does his job as the lovable music director with ease. Young grandson was also as cute as the original. Everyone else is fitting, and honestly I can't really comment on them as no one either stood out or distracted from the film. I was pleasantly surprised though with the older man who played the role of Mr. Park here, as he totally exceeded my expectations playing the loyal and lovesick childhood friend. But I have to say the K-movie handled the overall plot much better, as for whatever reason this version decided to cut out plenty of moments near the end. This included the important resolutions to music-director love story and the movie's pre-credit ending. First regarding the love story. Everything up through the overnight stay worked better for me in this version, because Bolin and Zi Shan had much better chemistry than Lee Jin Wook and Shim. They looked far more age-appropriate and also carried a natural banter together on the screen better than their Korean counterparts. I also liked the dialog on the overnight stay here, with the fear of darkness, more than the drunken escapades of the K-movie, because it made so much more understandable just why he liked her (even though I'll admit the drunken scene made for funner viewing). Both versions I think left a lot on the table in terms of the potential that could have been explored with this relationship. I do give kudos to the T-version for making the feelings clear and portraying them as actually dating before she turns back. But the ending of this arc here just felt like a huge letdown. He gives her the hair clip, and then we literally just get a shot of him looking forlornly at her through the car. That's it? That's the big conclusion to the forbidden love? I mean even the K-movie achieved a forehead kiss, yet you couldn't do anything here other than a sad stare? Come on, the concept isn't even that prudish, yet you won't allow us the slightest skinship? The K-movie also gave us that moment when he sees the clip in her hair once she's returned to her older body. We basically don't see him ever again here. In fact, that's my second big complaint with this version, because it feels like they just decided to stop the movie without bothering to tie any arcs or add a fun twist. In fact, I find the ending almost depressing. It's as if the movie's final message was "Learn to deal with your normal life, as anything else is not sustainable." You all know how much I also loved the final Mr. Park twist in Miss Granny, which at least seemed to compensate a bit for the loss of the younger love interest. Well, I guess because it was too predictable they decided to just do away with it entirely here. I felt almost personally affronted when the credits started rolling, because really, you decide to copy everything word-for-word except for the best part? My final verdict is that if you've already seen Miss Granny, I'm not sure this version is worth your time. It's prettily shot and well-acted, but adds zero originality and even manages to be quite a disappointment by the end. Spend your time on a fresh film instead.